You are currently browsing the archives for the Terranigma category. 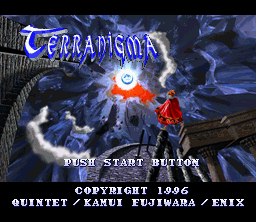 For those of us outside of Japan it may only have been out for 19 but, today Terranigma turns 20 years old! One of the three masterpieces of classic RPG/adventure games from the Super Nintendo era to which this entire website is dedicated and derives a significant part of it’s name. With a gripping story line, characters, music and art to match, Terranigma continues to shine as one of our favorites, when it comes to SNES era games. For this 20th year anniversary, I know that I’ll be picking up my dusty SNES controller and give it a good play through. Won’t you join? We have recently recieved some new Terranigma Rumors sent into us from De Narm, so you might want to check that out. Remember, if you have any Trilogy content that you think could be a nice addition to TerraEarth, please contact us. Everyone have a happy and safe Halloween weekend!